Sat 9-12 by appointment only. Hillside Beekeeping Supplies has been your local supplier of bee packages, bee hives, honey, extracting equipment and various beekeeping equipment for the past 26 years. 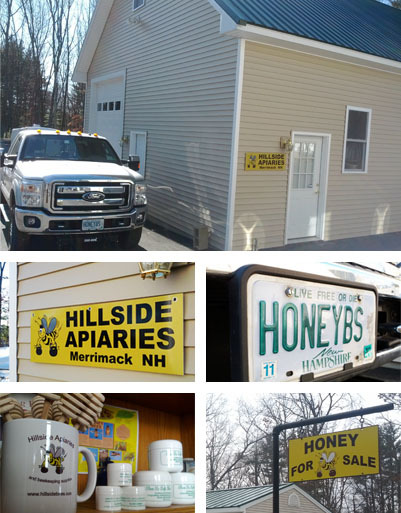 Located in Merrimack, NH, we have a stocked warehouse to serve local customers, and now we are happy to ship to customers near and far via our website www.hillsidebees.com. At Hillside Beekeeping Supplies, we not only know bees... we also stay on top of current trends and research in the beekeeping community to be able to provide you with the latest products to meet your needs (for example: we were one of the first in the area to offer Mite-Away Quick Strips as soon as they were approved for use by the State of New Hampshire!). We are a dealer for Maxant Honey Processing Equipment, Acorn Frames and Mite-Away. We also sell Mann Lake, Bee Smart, Wellscroft Electric Fencing Supplies and many other beekeeping products. Allen Lindahl's philosophy is simple: stock what people want, at a fair price, and sell them only what they need. Whether you are looking to purchase package bees, nucs, hive parts, complete hive systems, beekeeping tools, beekeeping clothing or integrated pest management supplies, Hillside Beekeeping Supplies is your one-stop-shop for all things bee! Thank you for visiting with us online. We hope to see you in Merrimack, NH soon. Sat. 9-12 by appt. only!